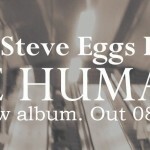 Share the post "Album review: STEVE EGGS – We Humans"
The Steve Eggs Band is a Brit-Americana into country rock outfit with strong songs, sparkling harmonies and a significant Tom Petty influence. ‘We Humans’ showcases ten original Eggs songs and one co-write with bassist Peter Wass. It’s a singer songwriter album given extra heft by country rock arrangements shot through with an imaginative array of guitar tones and meaningful solos from guitarist Jon Kershaw, who always serves the song. Eggs is a thoughtful, narrative driven songwriter and a vocalist who is not averse to getting inside a song with an emotive timbre that draws the listener in. Eggs may provide the songs and the core voice, but the predominant sound is that of a well honed band who all full contribute to the melodic sound. ‘We Humans’ is an album made with self evident love and care, as reflected by the 4 years of its making. Nevertheless it still sounds like a coherent album that flows from beginning to end on the back of sweeping melodies and catchy hooks that in a previous era would have found a home on Radio 2. The album opens with the clang of a Beatles style power chord on ‘Slipstream’, a catchy country rocker with stellar harmonies and an uplifting hook. Kershaw adds a propulsive Sonny Landreth style tone and rhythm, before resolving the self built tension with a succinct solo topped by a harmony guitar line. ‘Slipstream’ is a decent barometer of what to expect, as the band strikes a delicate balance between Eggs’s lyrics and their own ability to rock. ‘Ghost Train’ is a very good example of this, while the mellifluous ‘The Ballad Of Wah Wah Banjo’ finds the band stretching out on a lovely 6 string sounding jangling guitar sound. It’s a sumptuous melody with a tremulous David Surkamp (Pavlov’s Dog) style vocal and a marvellous wah-wah solo that reflects the song’s title. There’ s diversity and contrast too, as the wah solo gives way to ‘Darlin’ a song topped and tailed by a Neil Young signature harp flourish, as Egg’s vocal line is interwoven with Kershaw’s rich toned guitar on a fine ballad. There’s a good balance of rock, country, ballads and Brit Americana. The latter comes into play on the beautifully crafted ‘Far Away’, which features a lovely nuanced intro on a stripped down ballad with a sublimated Celtic feel. The mix of delicate tones, Mark Taylor’s lovely percussive brush strokes and Eggs’s restrained vocal makes the song an album highlight. Eggs never strays too far away from his favourite singer songwriter forte, with ‘SS California’ featuring more jangling guitars on a folk song with a historic bent. There’s a similar focus on his lyrics and phrasing on ‘Here’, a song that lets the melody breath and the harmonies linger. Refreshingly, the band adds a lightness of touch when they do rock out, as on the tightly wrapped ‘It’s Alright’ and the country picked rocker ‘Love & Grace’. The latter benefits from good bv’s and Kershaw’s ability to add conversational licks that mirror the vocal line. The two tracks are very similar, but are wisely being separated by just one track, which again adds to the flow of the album. The sub-waltz style of the title track neatly wraps up an exhilarating album on which songcraft enjoys an all too rare primacy. ‘We Humans’ enjoys an irresistible pull and a final uplifting chorus that should lead the discerning listener to hit the repeat button. Recorded in Wallington, Surrey – just up the road from his native Sutton – Steve Eggs and his band are a great example of the resilience of independent musicians. They’ve worked on their songs, added Andy Brook’s intuitive production and finally after 4 years of painstakingly honing their craft, they’ve released a splendid album worthy of the ‘We Humans’ title. This entry was posted in ALBUM REVIEWS, ALBUM REVIEWS (Mobile), All Posts and tagged album, Andy Brooks, ballads, Brit Americana, Celtic, country, David Surkamp, Jon Kershaw, Mark Taylor, Neil Young, Pavlov's Dog, Peter Wass, review, rock, singer, songwriter, Sonny Landreth, Steve Eggs, Steve Eggs Band, The Beatles, Tom Petty, We Humans. Bookmark the permalink.